An American craft distiller has produced a smoky corn American whisky. 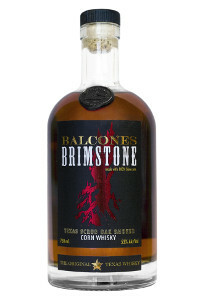 It's been distilled by Balcones and had been wittingly named 'the Brimstone'. The whisky itself has been smoked rather than the grain. This is quite an innovative technique, which had created a current buzz around American whisky. Nose: Barbecue, steaks, brown sugar, raisins, sweet notes of honey roast pork. Palate: Noticeably peppery and sweet yet balanced with notes of herbal undertones and BBQ sauce. Finish: The finish leaves you with a peppery steak with slightly charcoal too!